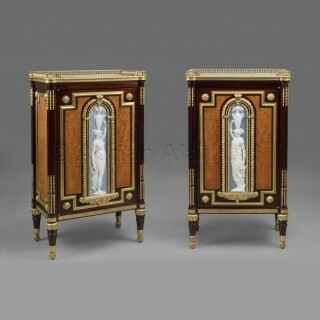 A Rare and Highly Important Pair of Neoclassical Style Gilt-Bronze and Biscuit Porcelain Mounted Mahogany Side Cabinets, by Jules Piret. French, circa 1860 incorporating 18th century elements. 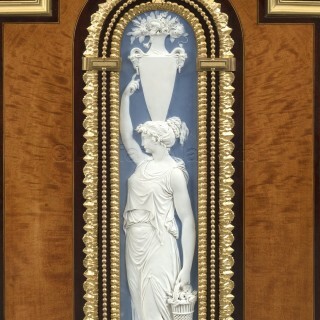 The porcelain plaques late 18th century. Stamped to the reverse of the bronze mounts to the doors ‘J Piret’. Stamped to the interior of one cabinet ‘J.H. RIESENER JME’. The back of each cabinet branded with ‘LPI’ below a crown for Louis-Philippe-Joseph II, Duc d’Orléans (1747-93). 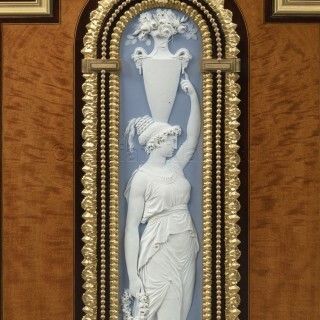 Each cabinet has a gilt-bronze three-quarter gallery and an inset grey marble top, above a cupboard door centred by a very fine biscuit porcelain plaque depicting a maiden with a vase of flowers against a pale blue reserve, set within finely cast gilt-bronze acanthus frames, the corners of the door mounted with flower head rosettes and the lock concealed by a thumb slide to the gilt-bronze encadrement; the uprights carved as fluted half columns adorned with gilt-bronze harebells and each cabinet raised on turned tapering legs headed by lotus cast mounts and terminating in whorl cast feet. 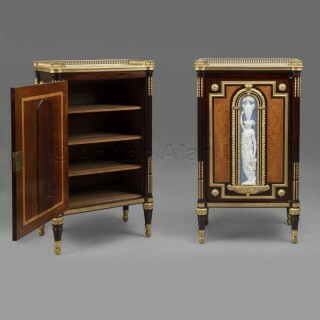 This exceptional pair of cabinets epitomise the sophistication of furniture created in Paris during the mid-nineteenth century; the simpler neo-classical forms, that came to predominate during the Restoration, being enlivened with a refined ornamentation taken from the XVI period to achieve a successful aesthetic balance whilst affirming a positive continuity with the ancien regime. Under the hands of the master ébéniste Jules Piret, we witness this desire to reconnect with the ancien regime, whilst refining the more overblown elements of Louis XVI decoration, distinctly defined. The use of 18th-century elements would have been not only an efficacious choice for Piret, but to the nineteenth century sensibility an approach that instilled authenticity to an otherwise neoteric creation. The backboards of each of the present cabinets are branded with LPI beneath a Crown for Louis-Philippe-Joseph II, Duc d’Orléans (1747-93), father of King Louis-Philippe – an unusual and somewhat odd choice should they be spurious marks, suggesting that these elements have been repurposed from an earlier item of noble provenance or embellished for one of the residences restituted to his son, the future King Louis Philippe. Louis-Philippe-Joseph II was vastly wealthy both in his own right and through his marriage to his wife, the only surviving child of the Duc de Penthièvre, one of the richest men in France. In addition to the estates and furniture that were part of his wife’s dowry, the Duc d’Orléans’ principal residences were the Palais Royal, Saint Cloud and the chateau d’Eu. The biscuit porcelain plaques in the manner of Wedgwood’s Jasper ware, that adorn the centre panels of the doors, date from the late 18th century and are of truly exceptional quality both in their design and execution. The fashion for porcelain mounted onto exquisite furniture pieces was brought to the novelty seeking Parisian connoisseurs by ébénistes working for the principal ‘marchand-merciers’ around 1760. The original pioneer was Simon-Philippe Poirier, the celebrated ‘marchand-mercier’, working chiefly with the ébéniste Martin Carlin, who ordered his first plaques in 1758. These items were rare and sought after even at the time of their production, and most examples now reside in museum collections. The 19th century saw a revival for this fashion in porcelain-mounted furniture typifying the fascination with ‘ancien regime’ opulence. 18th century plaques were often available to buy in the 19th century and many dealers would acquire them and either alter existing pieces or make new ones to receive the plaques. The best known of these dealers in France was A.L. Bellanger, Vaché and Jules Piret. A Louis XVI style console table by Piret incorporating 18th century Sèvres porcelain plaques to the frieze is in the collection of the Cleveland Museum, Ohio. In addition to the console table in the Cleveland Museum of Arts, a secrétaire à abattant by Piret, modelled after Weisweiller, is in the collection of the Victoria and Albert Museum, London (1068:1, 2-1882). While interestingly a secretaire now in the Wallace collection by Andre Shurmann (master 1779), acquired at auction in London in 1859 by Lord Hertford and incorporating Sèvres porcelain Plaques, has Piret’s stamp to the reverse of five of the gilt-bronze pendants, perhaps suggesting his involvement in the embellishment or restoration of this item. (See Payne p. 219, Paris Furniture ). Payne, Christopher, Paris Furniture: The Luxury Market of the 19th Century, Editions Monelle Hayot (Saint-Remy-en-l’Eau), 2018; p. 219, 488. Denise Ledoux-Lebard,, ‘Les Ebenistes du XIX Siecle’; p. 523-524. Jules Piret was a Parisian ébéniste specialising in the production of high-quality furniture in the Louis XIV, Louis XV and Louis XVI styles and the restoration of precious objects. He is recorded in Paris at 18 rue Saint Hyacinthe Saint Michel from 1856, rue Saint Louis en l’lle in 1863 and 12 rue Charles from 1870 – 1876. Works by Piret are always of the very highest quality but very rarely appear on the market. 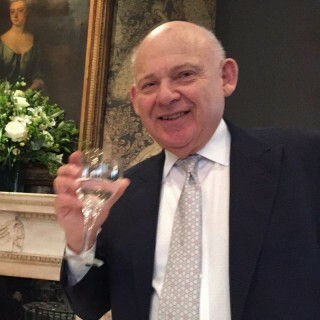 Several important examples of his work are in museum collections including a Louis XVI style console table incorporating 18th century Sèvres porcelain plaques to the frieze, in the collection of the Cleveland Museum, Ohio. A secrétaire à abattant, modelled after Weisweiller is in the Jones collection at the Victoria and Albert Museum, London (1068:1, 2-1882); possibly acquired by John Jones as an original 18th century example. Ledoux-Lebard, Denise. Les Ebénistes Du XIXe Siècle, Les Editions de l’Amateur, (Paris), 1965; p. 523 -524. Payne, Christopher, Paris Furniture: The Luxury Market of the 19th Century, Editions Monelle Hayot (Saint-Remy-en-l’Eau), 2018; p.488.